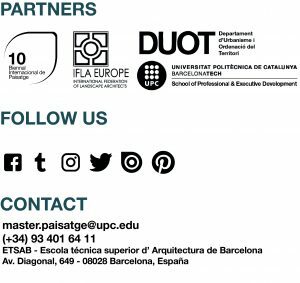 MASTER FINAL PROJECT – Master in Landscape Architecture Barcelona – Universitat Politècnica de Catalunya – 35ª EDITION. In the first part of this course, the students will undergo an immersion period of 250 hours of work experience in some international or national landscape offices where we have a collaboration agreement. A professional tutor will be assigned to each student and welcome him or her and supervise his or her progress in the workplace. The students will have to produce a research project or thesis of a critical nature and showing a holistic vision concerning all the knowledge assimilated throughout the master and specifically based on the knowledge acquired during the work experience stage. Is held over ten weeks from Monday December 11, 2017, to Friday March 13, 2018, with practice Monday to Friday from 9 h to 14 h.
Is held over twenty weeks from October 2017, to March 2018. – Join a work environment and develop specific professional skills related to ongoing designed projects in professional studios. – Critically reflect on the professional practice and on the work accomplished during the internship in order to produce a personal, critical and research dissertation that holistically comprises the guise of knowledge assimilated during the whole Master. – Arrange and structure knowledge in order to build a new research mode based on reflection and practice.